Hi! 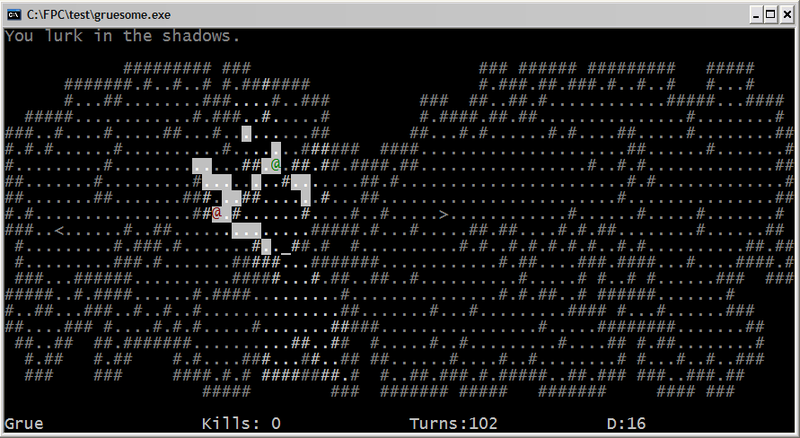 My name's Darren Grey - I make roguelike games and write for other games. I also host a podcast about roguelikes, procedural generation and game design. This is my rather basic personal page for game-related stuff. 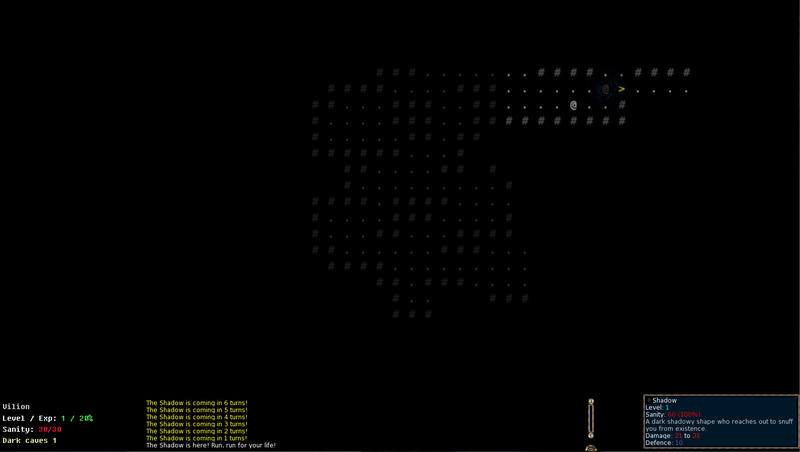 I host and organise Roguelike Radio, the world's number 1 roguelike design focused podcast! We've been running it since 2012, with over 130 episodes released to date. The podcast has numerous episodes on design topics, individual games and interviews with well-known developers. I have written The Comet's Trail and co-authored Ode to Betty Cole in Elite: Tales from the Frontier, an official tie-in anthology to the epic space game Elite: Dangerous. The book is available in a really amazing audiobook format! I have written extensively for the main campaign of Tales of Maj'Eyal, an epic fantasy RPG by Nicolas Casalini. 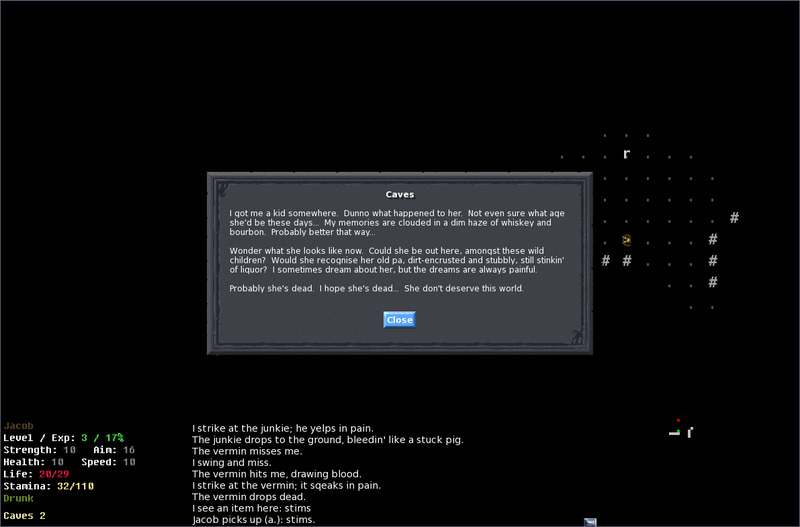 In-game you can find over a hundred short stories, poems, lore snippets and even a novella or two written by me. 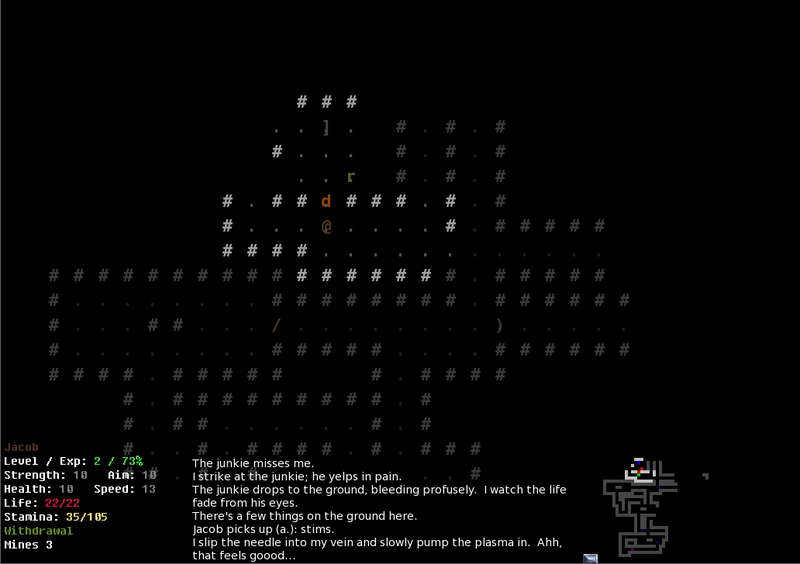 Jupiter Hell is an in-development game by Kornel Kisieliwicz, maker of Doom the Roguelike. I am on the devteam as writer and co-designer. Look out for an early release 2017/18. 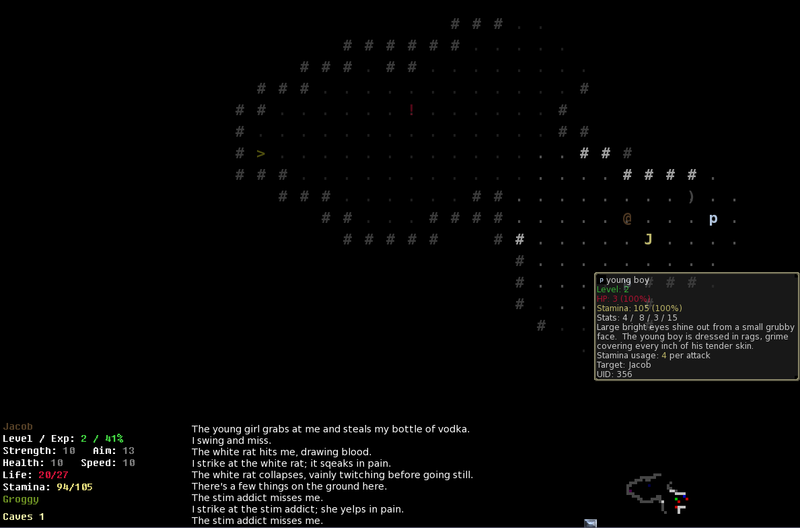 Let's Play videos by Rogueliker and CrazedNaly. Let's Play videos by The Indie Ocean and CrazedNaly. 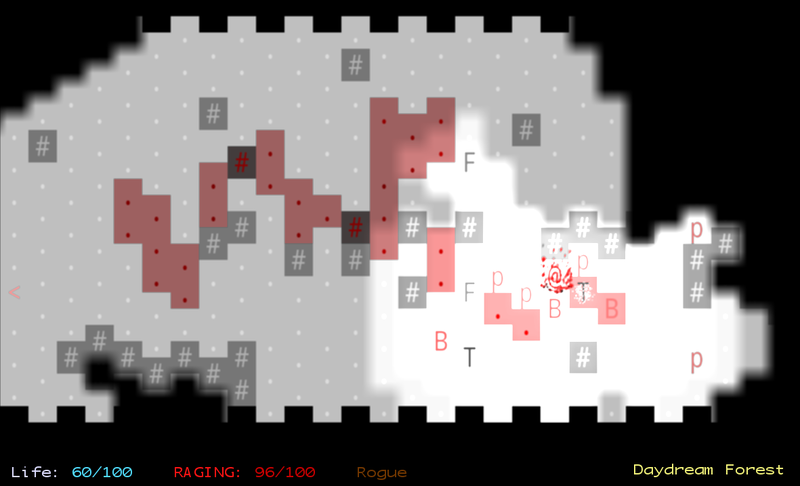 Hex-based tactical game of bug elimination on an ever-changing map. Connect the nodes, destroy the gridvaders, use the powers of the DataQueen! A Let's Play video by GameHunter. Made for the Molyjam 2013, and based on the insights into the freemium industry by Ramin Shokrizade. Lay colourful mosaic tiles on a grid with your movements, trying to encase enemies in art to dispel them. 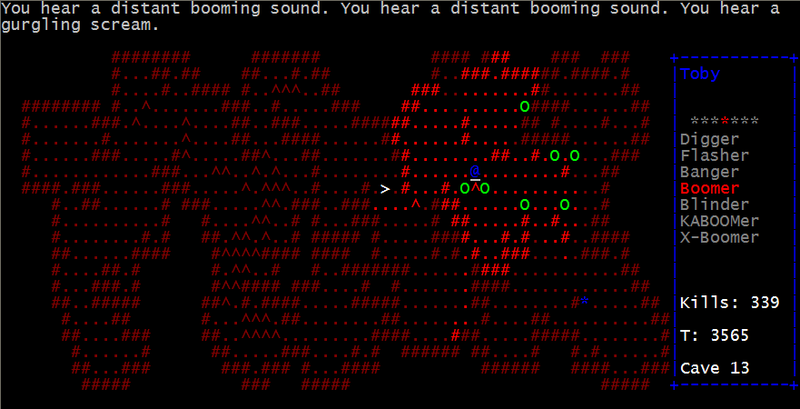 Music is procedurally generated based on which parts of the map you have filled in. The game is simple to play, with 4-way movement being the only input, but it is tricky to master. It's also quite pretty sometimes! 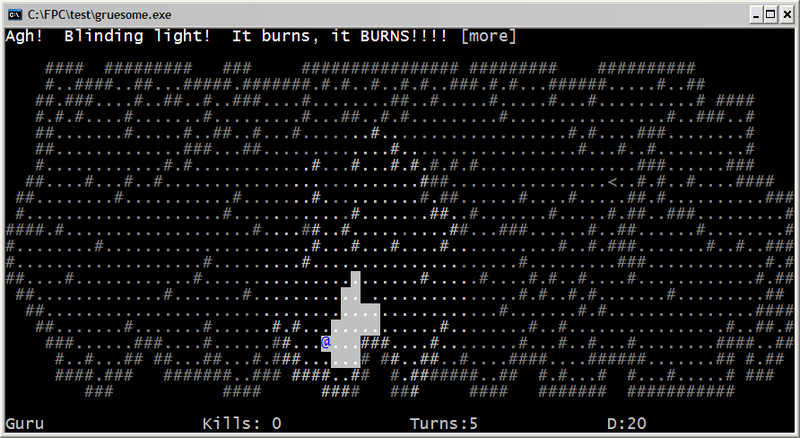 Rogue Rage is a failed 7DRL that is still in development. You can play a beta of it now if you like though. 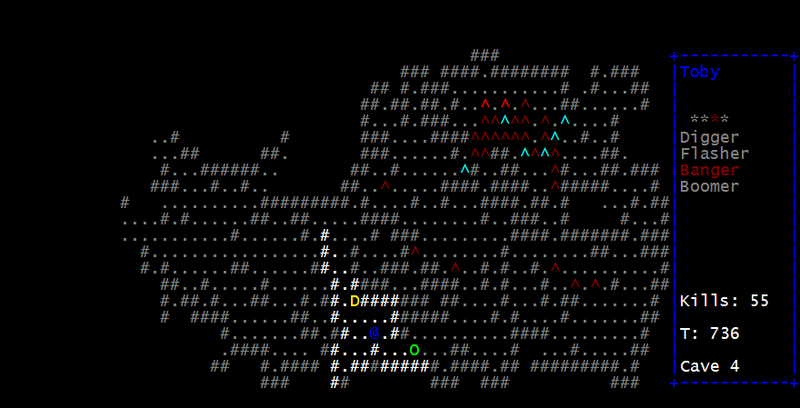 It's designed to make ASCII look cool and to have emergent depth with a low number of controls. Innovative features include stance-based combat effects and passively attacking adjacent foes. It is written for beta 38 of the T-Engine. 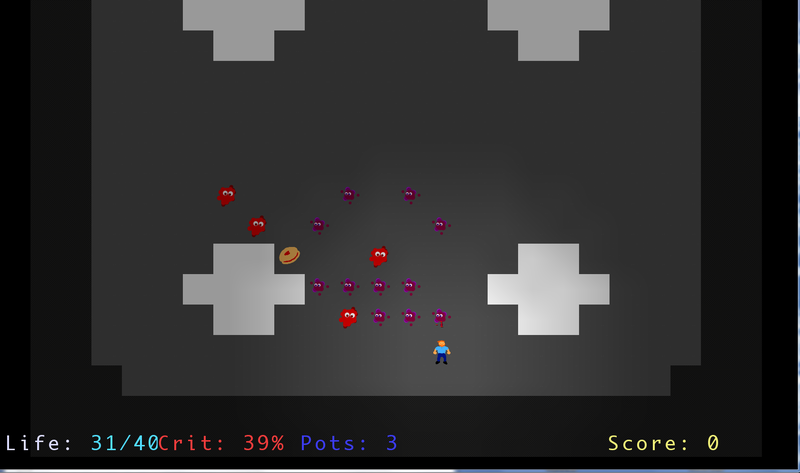 sick peter is a pretentious arty game I made in 5 hours for the Molyjam 2012. In “sick peter” you play a terminally ill four year old Jewish boy looking for his lost mother in Nazi-occupied Holland. It’s a stealth game mostly – you have to avoid the German guards whilst also managing your depleting stamina, which gets harder as your illness creeps up on you. It is written for beta 38 of the T-Engine. 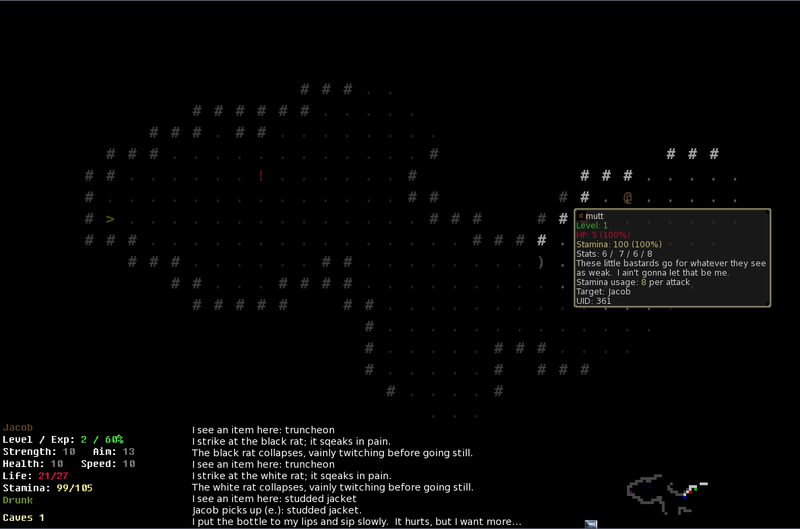 Harrowed is a very simplistic roguelike written in 1 hour for the Ludum Dare Zero Hour Game Jam 2011. I wrote it whilst drunk, so I'm personally I'm impressed it even loads. 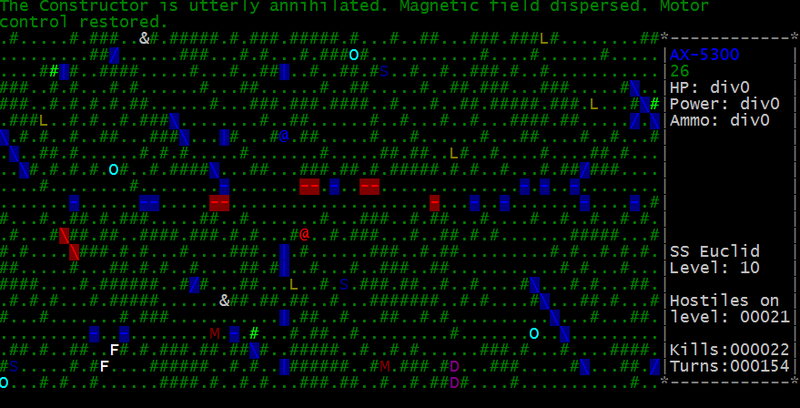 It's about as streamlined as a roguelike can get. It is written for beta 34 of the T-Engine. 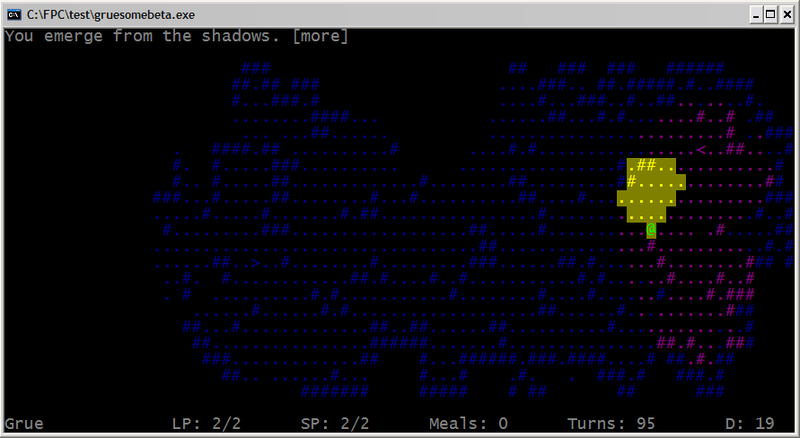 Run from the Shadow is a streamlined roguelike involving a constant flight from the boss of the game, as you gradually build up the strength to face it. The game is themed around guilt, and the various ways people suppress this in real life. It was written in under 2 days and is overdue an update. It is written for beta 34 of the T-Engine. 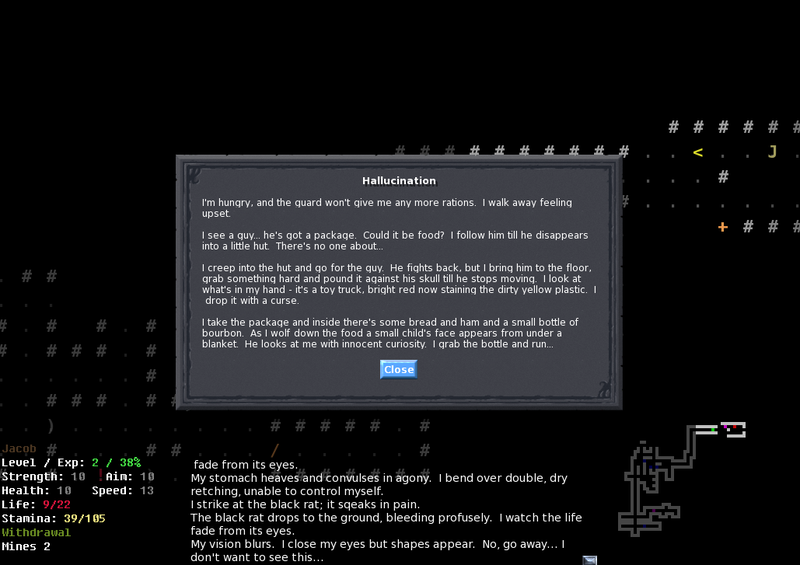 Broken Bottle is a game about alcoholism and brutality in a post-apocalyptic world. 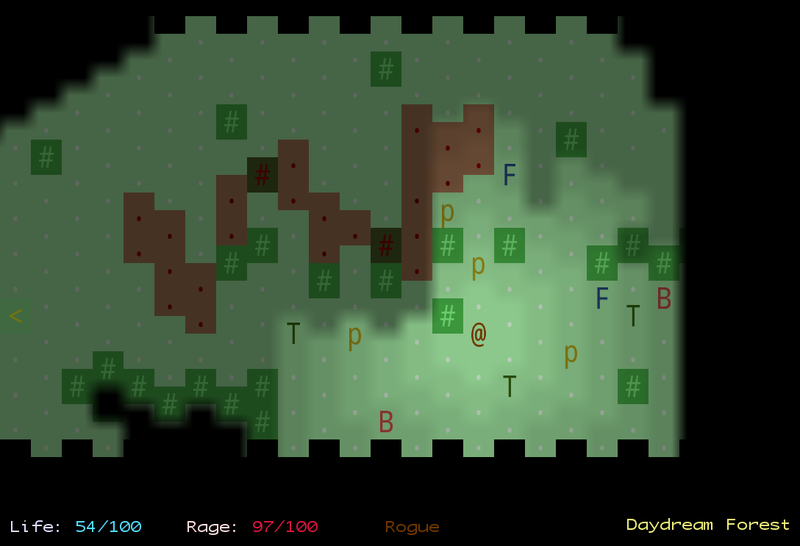 It was written for the Seven Day Roguelike Challenge 2011, but has been updated a little since. The game is very story-focused, told from thefirst-person perspective of an alcoholic as he tries to find the surface following a nuclear war. Alcohol also plays an important part in several game dynamics. 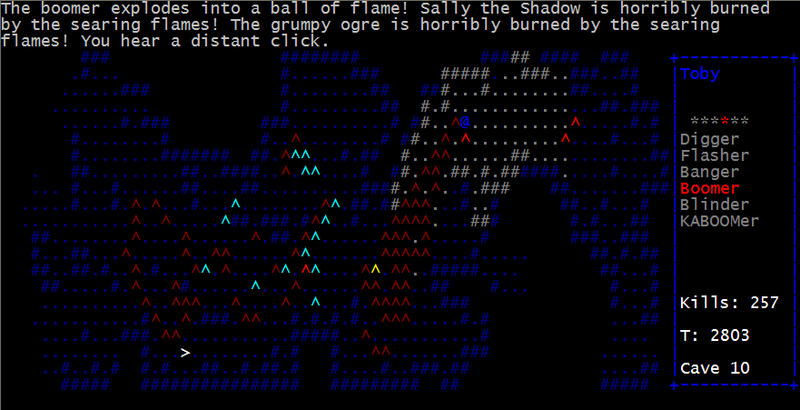 It is made using DarkGod's T-Engine and written in Lua. Windows users can download the standalone version (preferred). Those on OSX or Linux will need to download the module folder and T-Engine beta 27, and put the module folder in the /game/modules/ directory of the T-Engine. 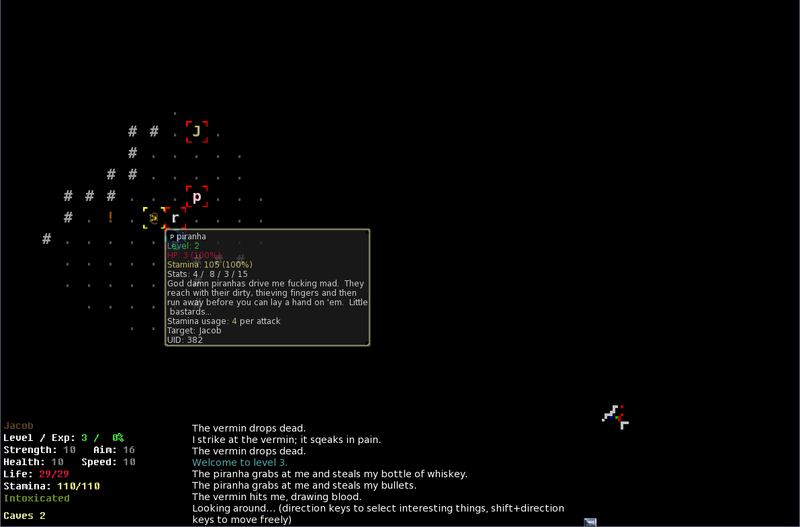 Toby the Trapper is a roguelike in which you can only harm enemies with traps you lay. 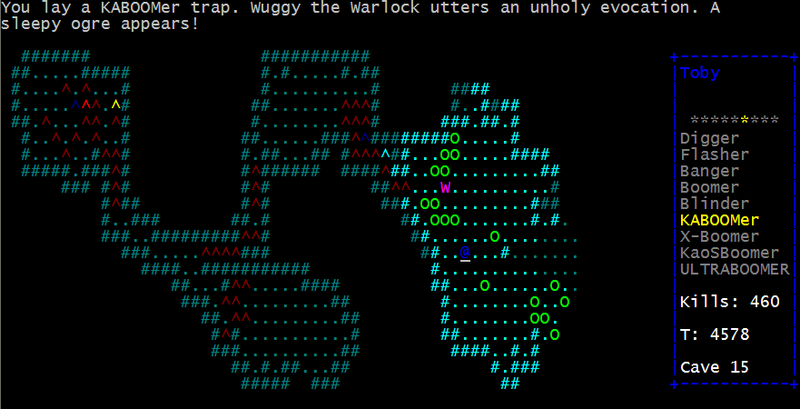 Control the fast-moving Toby to outwit the smelly ogres and the unique bosses, before taking on the evil might of Wuggy the Warlock. 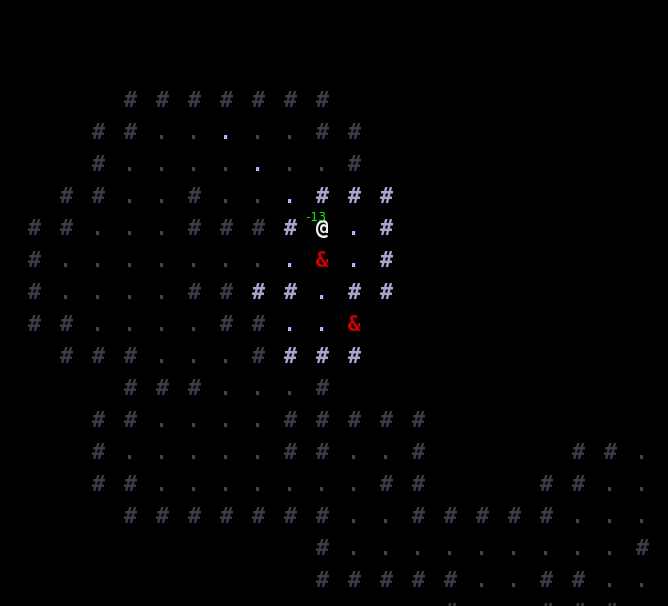 It was made for the Seven Day Roguelike Challenge 2010, but has received some updates since. Gruesome is a game in which you play the grue, hunting adventurers to eat in dark caves whilst avoiding the painful light of their torches. 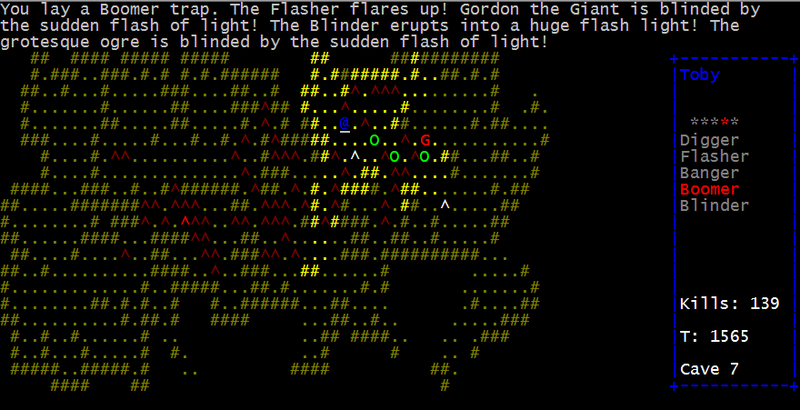 It was the first game I ever made, using Free Pascal, and is probably still my coolest game.